Break the chocolate into pieces and place in a pan with the milk. Heat slowly until the chocolate has melted and stir until smooth. Cream together the butter and sugar then gradually add the egg yolks, melted chocolate, flour, cocoa and dates. In a separate bowl, whisk the egg whites until stiff then fold into the chocolate mixture. Pour into a 1.2 litre greased ovenproof dish. Stand the dish in a roasting tin half full of hot water and bake in a preheated oven 180ºC, gas mark 4 for 1 hour, covering with foil after 40 minutes. 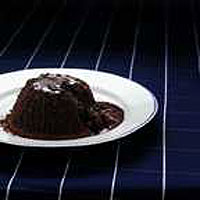 The pudding should be firm to the touch but runny underneath. Serve with vanilla ice cream. This recipe was first published in November 1998.